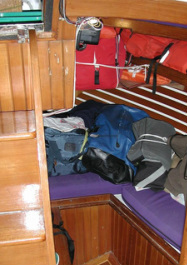 The red grab-bag is next to two life jackets. If we had to abandon ship immediately, we would put on our life jackets (if not already on!) and grab the cat, our Grab Bag from the quarter berth, and, if possible, the jug of water before deploying our life raft. What is in our Grab Bag? Cash, photocopies of passport identity pages and bank account details in a zip-locked bag. We also have two life jackets and 5-gallon jug of water (not pictured) near the Grab Bag. We change the water before each passage to keep fresh. Note: the life raft also includes some items, most notably a hand-held water maker (to remove the salt from sea water to make it drinkable).